NBC News takes a look back at Christmases past and present with members of nine presidential families over the past 50 years. NBC’s Meredith Vieira reports. >>> finally tonight, imagine being a kid waking up on christmas morning , running to the tree and the tree happens to be in the white house . only a select group of families know what that's like. and as part of a special airing tonight, nbc's meredith vieira recently had the chance to talk with some first ladies and their daughters about the beauty of the place this time of year. >> reporter: during the holiday season , visitors to the white house get a rare treat. 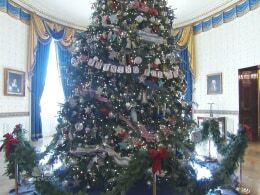 the rooms and halls are decked to the nins based on a theme picked by the first lady. >> it's always about adding a tone of life and light to what we do here. >> reporter: for those who have called this mansion home, christmas was always a special time. >> it really seemed when we were little like we were in this magical winter wonderland . >> reporter: the decor is on display for a marathon of parties. >> there are parties every day, it seems like. kids from my school would come. >> there is nothing more fun than a white house party. every once in a while we would hear there is a conga line of congressmen. >> reporter: and, of course, unveiling the gingerbread house is always an event. >> we have a snowman, snow lady, snow child . >> there is always a guest, because we wouldn't see it until it was unveiled. sometimes we did sneak down the night before. >> reporter: in addition to their formal roles, at christmas , the first families get a rare opportunity for some well-needed downtime. >> my family was in the white house every year except one, because we just loved christmas in washington and in the white house . >> merry christmas , operator. >> mer decree christmas , mr. president. >> reporter: former first daughter and "today" show contributor jenna bush -haeger went back to the white house to discuss the holiday season here with first lady michelle obama . >> what exactly is your role when it comes to the holidays every year? >> well, i'm the hostess-in-chief. >> welcome to the white house ! pretty cool, huh? >> reporter: what about your girls? what's their favorite part? >> oh, gosh. i think they just love the fact that the house is full of people and friends and music. you recall, whenever there are receptions downstairs, you hear the music just bubbling up. >> reporter: do you feel like this holiday especially you can relax with each other and just kind of take a breath? >> as you very well know, you know, this job never stops. i mean, it's a wonderful privilege, it's a blessing. no matter what we're dealing with around the world, the holidays are a time for us to all just be together and breathe and be thankful.